These monsters are the stuff of the primordial, collective subconscious. They’re born of nightmare, and grown through legends of dragons, sphinxes, leviathans, and darker things still. Some take up the Vigil to do battle against the greatest of monsters. Will You Slay The Dragons? 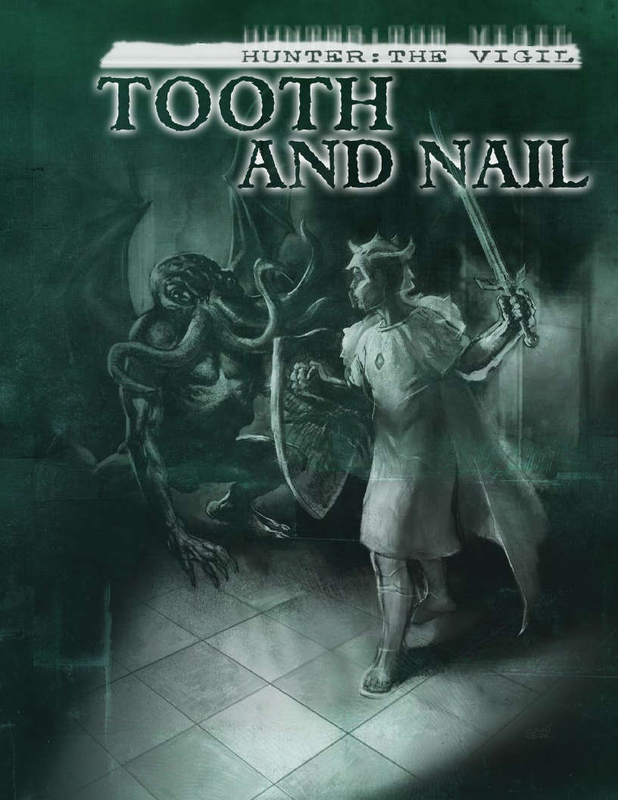 Tooth and Nail is a bonus chapter/companion book to the previous released Hunter: Mortal Remains that explores antagonists inspired by the Beast: the Primordial RPG. Fiction and story hooks to bring these beasts of legend to your Hunter: The Vigil chronicle. New Compacts and Conspiracies which hunt the monsters, but also sometimes hunt the zealous heroes that hunt as well. This book was made possible by the backers of the Beast: the Primordial Kickstarter. It is truly amazing how much the writers seem to hate heroes. The introductory chapter talks on and on about the complexity of morality and how diverse a beast's motivations and personal believes can be. But heroes are always zealous psychopaths who rationalize their atrocities away. "Decent" Heroes are a possibility but they don't get discussed anywhere. A book that says "There are no bad people, only bad actions." and then define a group of people as "they do bad things by default" doesn't really believe in the former. As someone who actually likes Beast the Primordial, would I find this book interesting? If I played/ran Beast, would I find the Hunter C&C detailed in here interesting? Does it remind Beasts that there are other things they need to worry about besides Heroes, Insatiable, and extended Family to worry about? What I'm asking is: Would this book be worth it to fans of either Hunters or Beasts? As a GM for Hunter, I think it's mildly useful. I'm running a full kitchen sink game, and so had to at least try to include Beasts. For my purposes, this book is significantly better than the thoroughly mediocre BtP core book. I don't GM BtP, and never will, as I don't especially like it. I can't imagine it being of too much use for you there, though. Many of the descriptions of things in T&N are set specifically for the Hunter point of view rather than the Beast one. The way the mechanics of actual Beasts as written are made, a NPC Hunter cell that actually threatened Beasts would be quite a stretch. Nice to see discussion is discouraged when it's not positive. David Hill is not a good writer if you want your role-playing pandering and politic free. If you don't mind this, then go for it. The hell dude? What are you talking about? Made a previous comment about wanting my escapism to be free of political discourse--especially when the options contained in the book only skew one way. Not happy with that, is all. I found the content of T&N rather less painful to read than that of core BtP (especially the truly awful pre-KS edit). Had some concerns in that regard, but I think overall the book works aside from some very clumsy sections that reek of the self-insert nature of beasts.